The first actual page of “The Stiff”, my webcomic from the 2000s that I’m currently re-posting (and continuing) on this website! At the moment I’m still working overtime on my comic for the “Anything That Loves” anthology, which should hopefully be done in a day or two. This seems like as good a time as many to mention that I love horror and I love good zombie movies. There are so many great ones: Romero’s first two zombie movies, Cronenberg’s “Shivers,” “28 Days Later” (mostly), “Return of the Living Dead”…. I even liked Zack Snyder’s “Dawn of the Dead” remake (despite its apoliticism — I was hoping for some social commentary but frankly, I think Romero has been trying to hard to be political in his old age) and I’m looking forward to this summer’s World War Z movie. Sure, it’ll be totally unfaithful to the book, but THOSE ZOMBIE SCENES. 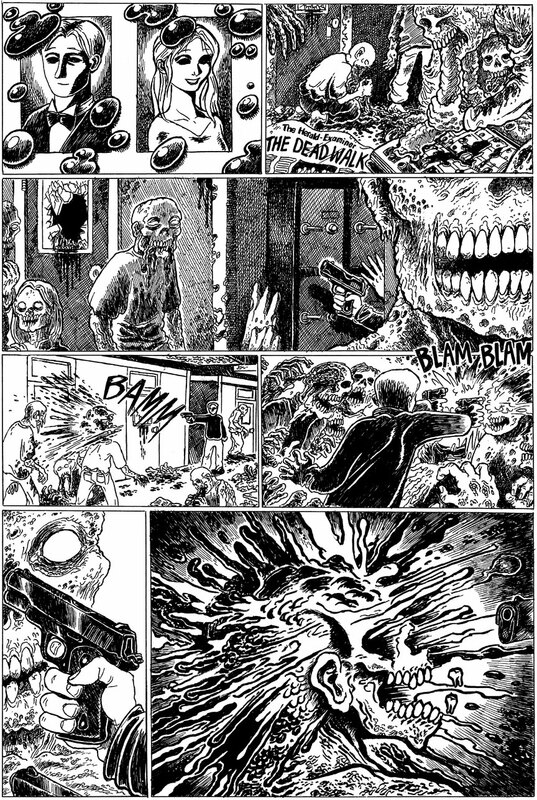 I don’t share the common prejudice against running zombies. Not to get all Rainbow Coalition, but there’s room for all types of zombies in this world. There’s plenty of reasons to dread WWZ, not counting unfaithfulness to the source material: for instance, the PG-13 rating, and the producers talking about how they left it open for a sequel, so you know the ending will have problems. Brad Pitt noted in interviews that they cut some scenes which were “too political”, which I wonder might be a reference to the Israeli-Palestinian scenes featured in the trailer (or, the apparently-cut scenes in which the characters speculate that the zombie plague originated in China?). I also have to admit that when I heard the movie was going to star Brad Pitt, somehow my mind translated that as “Nicholas Cage,” so until I actually saw Brad Pitt in the trailer I was expecting a Nicholas Cage vehicle instead of a Brad Pitt vehicle. So that was a relief. Despite all my nitpicks, I definitely have to see that movie. Now back to comics. In the book “World War Z” (which is fine fiction with a global feel) showed us that the earliest known reanimated corpse had been captured in China in the scattered population area and it was a child. The wave of cadaverous cannibals reminds me of a hoard of ants on the move. Probably designed after how they attack in swarms. Though in “28 Days Later” they weren’t dead, they did have some hyper form of rabies that was just as bad. Believe me if one is weaponized and released it would serve the same function. A fantastic weapon but near uncontrollable. I am partial to what “Resident Evil” has done since the reanimated dead are just a side effect of the T-virus along with all the mutant humans, animals and plants plus the conspiracy of the Umbrella (and other) corporation. Nick Cage probably stars is a parallel world version of “WWZ” you just got a psychic flash from it. I can like the visual aesthetics, it’s the psychological side that I detest. I also particularly dislike horror-movie soundtracks/music (you know… dissonant notes slowly increasing in volume until there’s some big sharp noise and something suddenly happens). That cheap, manipulative (and let me add, lazy) technique is in so many TV shows now, I can’t stand to watch most of ’em. Kill it with a rusty fork, someone. Movies I like that other people consider scary or creepy (for whatever reason): Krysar (1985), The City of Lost Children (1995), One Night in One City (2007). All of those have dark aesthetics but I wouldn’t consider any of them to be horror. Esn: others have written of the recurring American popcultural fascination with the undead. It always coincides with periods of social disorder, a perception (not necessarily grounded in hard facts) of increased danger from violent crime, and hard economic times. Zombies are uncontrollable, unstoppable, mindless forces of nature; they are anthropomorphized decay, despair, destruction, and entropy. Vampires are glamorous immortal creatures that cheat death, survive the unsurvivable, do the impossible, and have powers beyond those of mere mortals. They do what they want, even if it is impossible; they are not subject to the laws of man nor even the laws of nature. When Americans become obsessed with zombies and/or vampires, it normally means the economy is in the shitter and people are terrified of the future. See also, the late 1970s. You know, Nosferatu (from the 1920s) had some great scenes. That’s the sort of horror I could like. Too bad the movie as a whole was so uneven. I would think Lovecraft’s version of ghouls would me much more frightening. Especially since some people can turn into them. Certainly “The Walking Dead” is well done and it is all about the people just as Romero has done. The effects are so good you just move on as if it is normal for that time and place. I never played the Resident Evil games but I do like the movies. And the CGI movies too though I only have seen one “Resident Evil: Regeneration.” Which is closer to the time line of the games.